Marketing is about people. Much of the activity of marketing is not. Maybe that's why we love refer-a-friend so much. It's how your customer want to engage with your brand and with their friends. People-based marketing. Yes! We also love that referral marketing is backed up by more than just our idea of how good it is. Here are 15 statistics that show how your customers and prospects value refer-a-friend and how brands value it too. Referral marketing is an avenue for building trust with new customers of all ages. It makes people more likely to consider purchasing from your brand, and builds an instant connection between you and your new customers. Let's go over some of the statistics that prove just how powerful referral marketing is. 28% of millennials say they won't try a product if their friends don't approve of it. Word of mouth is the primary factor behind 20-50% of purchasing decisions. Referral programs combine that seal of approval with the one-two punch of a reward. Customers who are referred to your brand are up to 5x more likely to use your referral program than customers who weren't. The numbers here don't lie. In a world where consumers are more and more bombarded by ads, brand placement and branded content, word of mouth is a way for consumers to break through that noise. Which do you trust more: an autoplay video on your Twitter feed, or your best friend tweeting that they love and recommend a product? As consumers become warier of and fatigued by ads, referral marketing continues to shine. Referral marketing is an avenue for building trust with new customers of all ages. Referred customers' LTV is 16% higher when compared to non-referred customers. Customers acquired through referrals have a 37% higher retention rate and 81% of consumers are more likely to engage with brands that have reward programs. Referred customers have an 18% lower churn than customers acquired by other means. You can expect at least 16% more in profits from referred customers. These numbers really drive home the value that referral programs bring to your company. Customers are indeed more likely to become loyal to your brand and spend money on your product when referred. Part of this is because referrals take advantage of strong social bonds and can help consumers wade through shopping options more quickly. Another important factor is that the traffic you generate through referrals tend to be well-qualified. That is, most of the people who are referred to you will be interested right off the bat. Part of the beauty of referrals is that they form a positive feedback loop. When advocates share, the people they share with are more likely to become advocates themselves. The spark for this loop is how you market refer-a-friend to your customers. Your referral calls-to-action set the referral magic into motion. The make-up of your plan for marketing refer-a-friend is directly related to how many advocates engage and how much revenue you realize from sharing. 83% of customers are willing to refer after a positive shopping experience – make it easy for them! Customers are 4x more likely to share when the sharing CTA is integrated into their journey, not on a hidden landing page somewhere on your website. 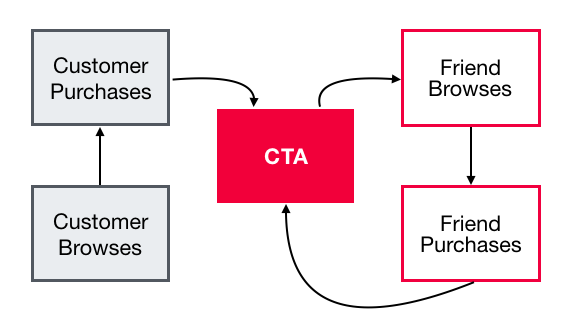 When a CTA appears on your post-purchase page, customers are 16x more likely to share. If your advocacy program doesn't have refer-a-friend yet, it's never been easier to get into the game and never been more important. Helping your customers become brand advocates is a smart business move no matter which way you cut it.